John will be signing his latest book Why Fenway: Exploring the Red Sox Mystique. A tribute to the iconic baseball stadium and the team that plays there. 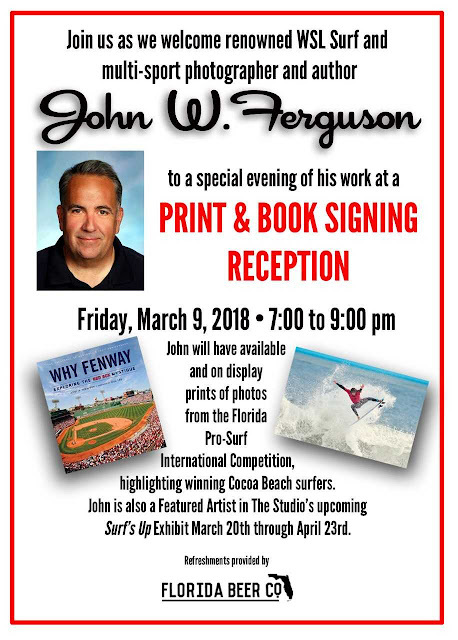 The evening will include refreshments by Florida Beer Co.
John W. Ferguson is an editorial photographer based in New York City, who has photographed many of the most famous faces and places.As a sport photographer, he began covering MLB and the NFL in 1991 , most notably the Boston Red Sox and the New York Football Giants.His photographs will be on display as part of the Surf’s Up exhibit at the Studios of Cocoa Beach, 165 Minuteman Causeway in Downtown Cocoa Beach thru April 23. Presenting the work of 25 local artists as well as monthly exhibits, the Studios of Cocoa Beach offers workshops in a variety of techniques for beginners to advanced, children and adults. The Studios is open Monday and Tuesday 10:30am-3:30 pm, Wednesday through Saturday 10:30 am-8pm and Sunday 11 am to 4 pm. 321-613-3480 www’studiosofcocoabeach.org.